Need to run a lot of fans off of one speed controlled connecter? Or maybe one very power hungry fan you are afraid to connect to you motherboard? This mod is for you. All you need is some connecters, which you probably already have, a MOSFET, and a resister, and a soldering iron. I used a Fairchild N-Channel MOSFET I got from mouser (P/N 512-FDP3682). I chose it to control some fans for a friend’s computer because it had a very low on resistance and very high amperage handling capabilities, 32Amps! This should be more than enough for a whole lot of average case fans or a few very high powered fans. 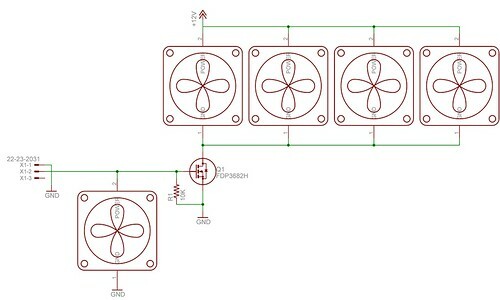 This is a Circuit Schematic for those of you who prefer them. So I had an old Flat Bed Scanner from Multifunction Printer/Scanner/Copier lying around and decided to try getting it to move. I used an Atmel ATMega48p-20PU microcontroller and a TI SN754410NE quadruple half-h driver. This is one of many projects I have been playing around with. This is one of Atmel’s ATmega644-20PU connected to an ELECTRONIC ASSEMBLY’s DOGM128S-6 graphical LCD display complete with the blue backlight. This video shows how the whole thing works together.